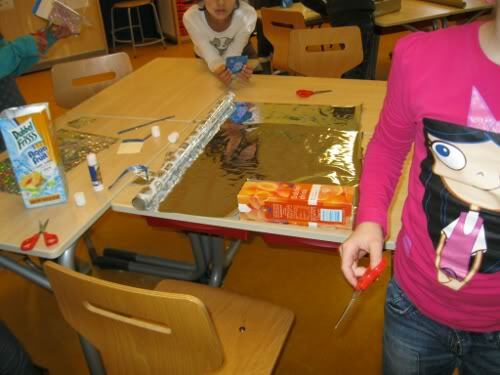 Location: Openbare basisschool "de Kubus"
Date: Tuesday, 20th November 2011 Target group: Group 4, primary school children Age: 6-8 years Number of participants: 14 Workshop given by: Melissa Tesha Location: Openbare basisschool "de Kubus"
The Netherlands Recycle material: used glass bottles Extra material: glue, glass paint, glitter and beads In this workshop the target group used glass paint, glitter and beads to decorate a used glass bottle which was later to be named "The bottle of guidance". 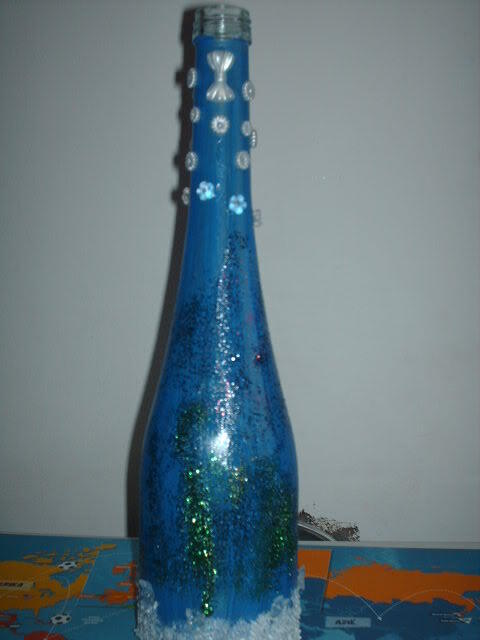 The concept involves creative recycling of glass bottles as well as development of positive qualities in young people. The inspiration for this project came from the knowledge that, while everyone at some point in their lives is taught and expected to live by certain values, most people (especially the young) need guidance to encourage them to develop and embrace positive values. 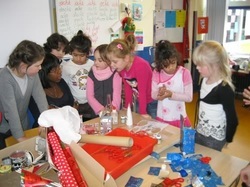 Teaching the target group to develop and creatively recycle glass bottles was therefore only part of the workshop. After the creative part of decorating the bottle , the students gathered and discussed various possible positive values that they wanted to put inside the class bottle. These values - such as politeness, generosity, kindness, obedience, honesty, discipline, silence, respect , awareness and others - were then written down on several pieces of paper which were afterwards folded and dropped inside the bottle. The students made a promise to pick one value every week and try apply it to their daily lives, with their teacher as the main guide. Not only is this workshop a way to promote environmental sustainability by breathing new life into old bottles but also a way to build on positive values and encourage personal growth. It has been a pleasure working with the young people and we hope there will be more opportunities to develop this particular workshop in the future.